At Eastern Dental in Grand Rapids, we are dedicated to the preservation of natural smiles. Dr. David Boone emphasizes the importance of education and healthy dental habits to keep his patients’ teeth and gums healthy. Learning how to maintain a bright and beautiful smile begins in childhood and lasts a lifetime. When your child commits to proper home oral hygiene, eats healthy foods, and sees Dr. Boone regularly, they can significantly increase chances of having a long-lasting, appealing, and functional smile. Tooth decay is generated by bacteria that feed on sugar and starches left on teeth. When children don’t brush and floss sufficiently, the bacteria have more time to cause the decay that creates cavities. When these cavities reach the inner portions of teeth, children can end up with a serious toothache and may require a root canal to save the tooth. Cavities can also grow large enough that a filling becomes inadequate to restore the tooth, leading to the need for a crown to be placed. Brushing twice daily (with an extra brushing after sticky foods) is recommended. A standard soft toothbrush with varying bristle sizes is appropriate. 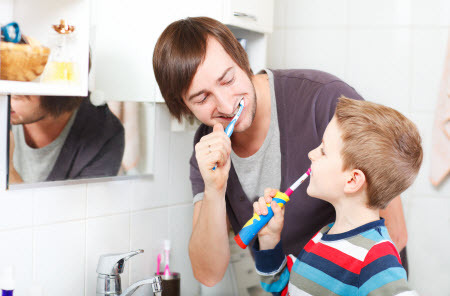 For children or those with dexterity issues, motorized toothbrushes can be more effective and might be a better choice. Use a fluoride toothpaste, as these have been proven to reduce cavities and can also help preserve enamel. Remind your child to floss daily, preferably after their last meal, to remove any food caught between teeth and keep those spaces clean. The right diet can improve your child’s oral health. Dairy products low in sugar and high in calcium help teeth stay healthy as do lean proteins that contain phosphorus. Crisp fruits and vegetables are especially good for teeth, while nuts, seeds, and other high fiber foods stimulate saliva production which is an effective oral protectant. Limit sugar intake and sticky treats and when they are consumed brush shortly after. Taking your child to the dentist twice a year is essential to keep their smile healthy and beautiful. Drinking Water - Drinking plenty of water helps keep your child’s mouth clean and prevents dry mouth, which contributes to decay. Arming our patients with this kind of knowledge is part of what we do at Eastern Dental in Grand Rapids. We hope that these tips and the care you receive from our dedicated team of dental professionals help your child maintain or regain a strong and healthy smile. For more information, or to schedule an appointment, call Dr. Boone at Eastern Dental today!